Hey guys and gals, guess where I'm going tomorrow? IF YOU GUESSED SONOMA CALIFORNIA THEN YOU WOULD BE CORRECT. So I'll be MIA from the blog for a little bit, but you can bet your sweet buns I'll be social media-ing the heck out of everything (you can follow here, here, and on my snapchat - username: newishcityhou). 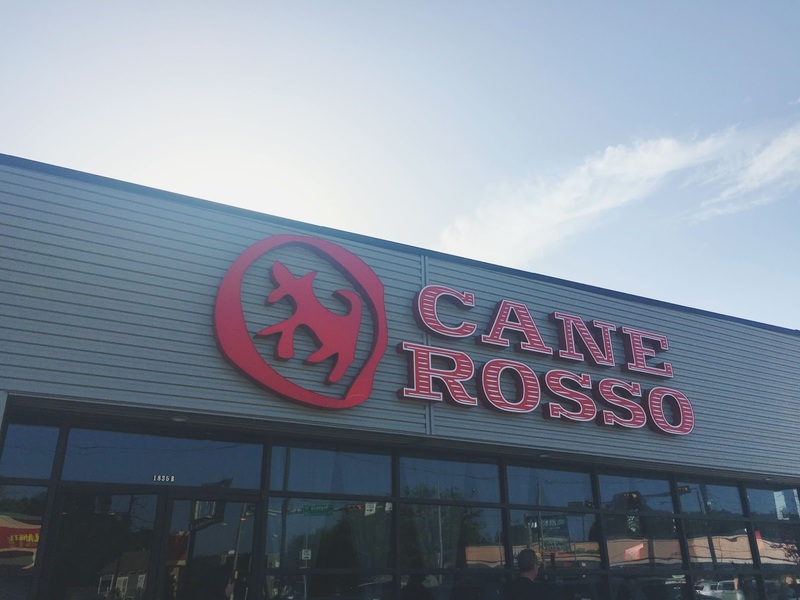 This week I had dinner with Jon and our friends Heather and Dan at the newly opened Houston Heights restaurant, Cane Rosso. Pronounced "Kahhh-Nayy" Rosso, this pizza spot originated in Dallas, but you should probably forgive them of that because the food is reeeallly good (sorry Dallas peeps, LoveYouMeanIt)! I'd been waiting for the opening of this restaurant for a while - ever since construction of the building started a few months ago (since I live in the Houston Heights nabe, I drive by it basically every day). Needless to say, I had some expectations, which were: 1) the food would be fantastic; and 2) the restaurant would be fancy, because, Dallas <~~(sorry again). I'll get to the tasty food in a minute, but my second assumption was way off. The restaurant was super casual (Jon glared at me after we walked in since I'd told him he probably shouldn't wear gym shorts, SORRY JON GYM SHORTS WOULD HAVE BEEN FINE), so I rescind my earlier statement, Dallas friends! <~~(see, now we are friends!) We also absolutely adored our enthusiastic and knowledgeable server, Cookie! I decided to kick things off with a martini with a twist, naturally. 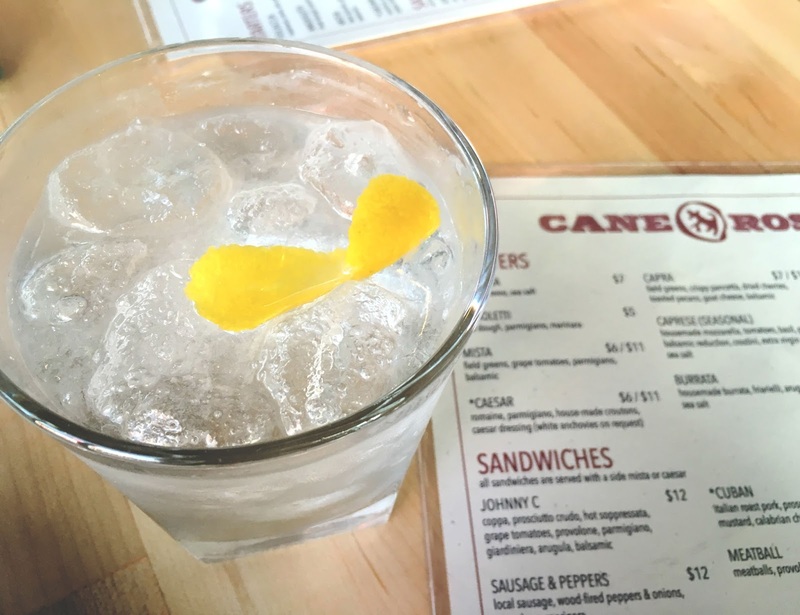 So Cane Rosso gave me another surprise with their unique take on a martini (in a rocks glass, with ice). And I still loved it! I mean, vodka, a twist - what's not to love? Based on a glowing review by my blogger pal Kylie (who also lives in Houston), we ordered the restaurant's burrata to start off our meal. And boy/girl, were we glad we did! The chilled (another surprise! 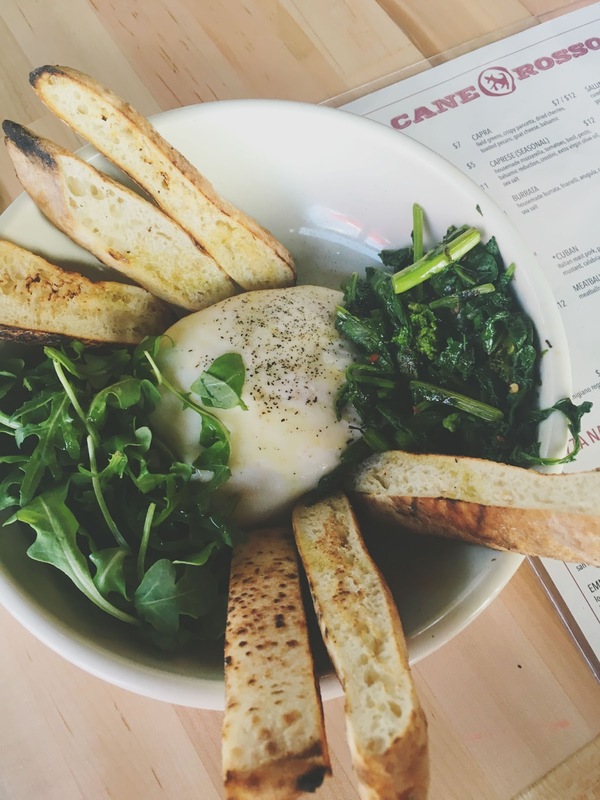 ), gooey, creamy, mild, house-made burrata paired phenomenally with warm, fresh crostini, and garlicky sauteed veggies (we think broccolini). I didn't top mine with the arugula it came with because I was already so blissed out of my mind with everything else. We did have to order more bread since there was so much cheese, but overall this was a fun and delicious appetizer! 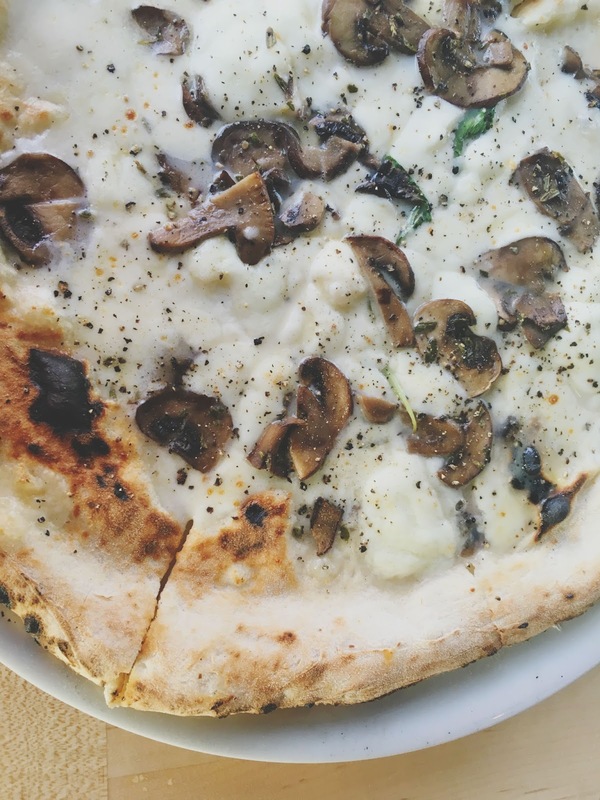 For my main course of food, I ordered the bianca pizza and asked them to add mushrooms to it. Cookie advised us to eat our pizzas with a fork and knife because the crust is super duper thin. And the menu informed us that true Neapolitan pizza is made with very soft flour and lots of water, which creates a "tip sag" - the "hot, wet, gooey center of the pie that will make the tip of your pizza...sag." My pizza certainly was unique, thin, doughy, and absolutely lovely. 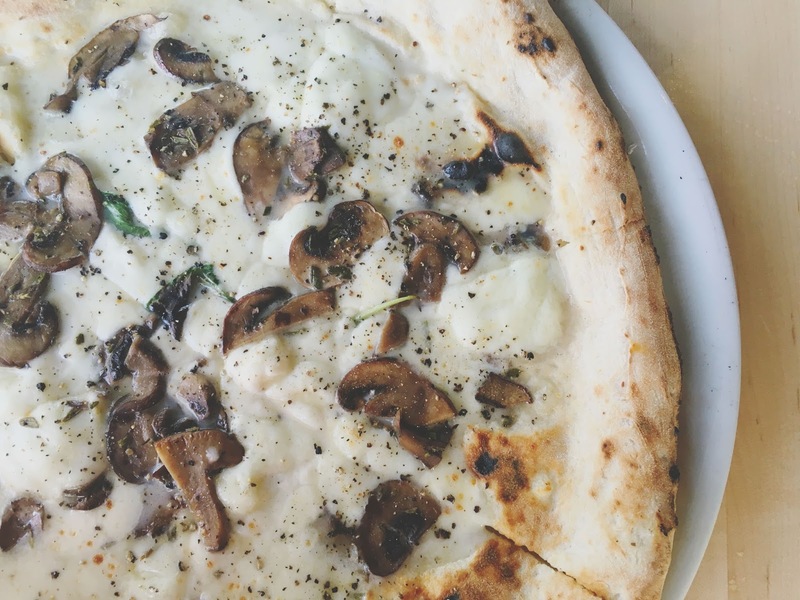 Comprised of soft, imported mozzarella di bufala; nutty parmigiano; velvety extra virgin olive oil; sea salt; black pepper; and earthy, delightful mushrooms, it was sheer decadence in a pizza. They definitely mastered the "simple yet complex" paradox with this pie. The flavors were fresh and vivacious, and the mushrooms added a wonderful new level of texture. It paired wonderfully with the bottle of dry aglianico we ordered. I will definitely get this exact pizza again! 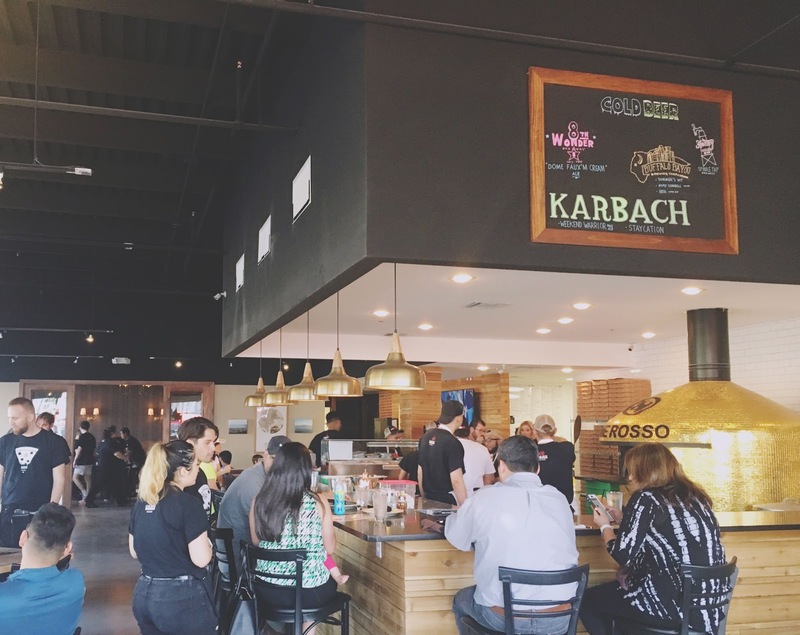 Houston is lucky to have this casual, delightful new addition to its restaurant scene. The food has a lovely simplicity to it, and yet you're bound to have a unique culinary experience when you dine there. 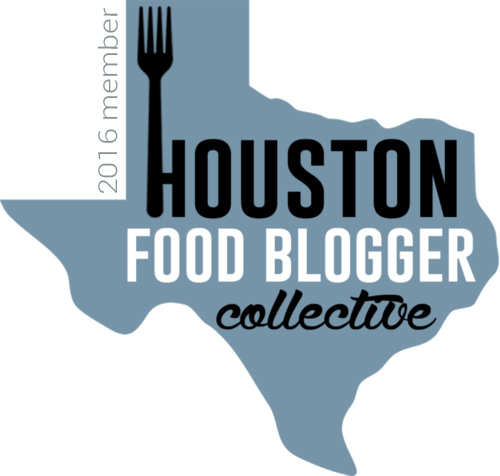 And be on the lookout for a new location in Houston's Montrose area soon! PEACE OUT HOUSTON I'M OFF TO DRINK ALL OF THE WINE AND EAT ALL OF THE FOOD FOR SEVEN DAYS STRAIGHT NOW, HELP ME. You make it look so easy. Oh, and I agree with Jon, a pizza without meat is just Pi (pronounced "Pee")... Great post! Keep on Keeping on! Eating pizza IS easy! ;) Thanks lady, and I appreciate you not judging me for eating pee...pi.